Feudal Wars | Play Feudal Wars free on iogames.space! You can play public ranked games by clicking the "find game" button. You can also play private games by yourself (vs. AI) or with friends. To play with friends, copy + paste the game room URL you will see after the map selection screen which appears after you click "private match." Start out with a small army of knights and a castle (which shoots arrows). Knights automatically spawn from your castle - use your knights to capture more castles and spawn more knights. The objective is too capture all castles to win, but castles also increase the size of your army. 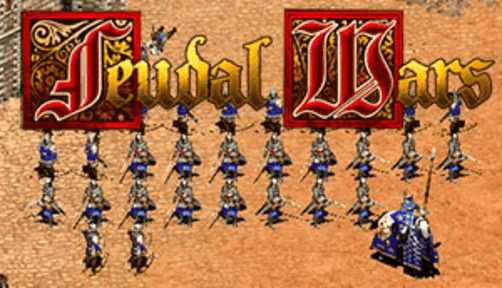 If you have 1 castle for example, your army can only be a maximum of 20 units. But with two castles, you can have an army of 40 units. That said, capturing castles is the quickest way to advance in the game. Learn which units counter which and build them appropriately. It is a rock-paper-scissors system. If your opponent is building nothing but cavalry (horse-back units which spawn from the stable), you'll want to build a lot of barracks, which produce polearm units that counter cavalry. Place watch towers behind walls for effective anti-archers. Archers only do a small amount of damage to buildings, so it's an effective counter. Cavalry also do very well against archers. Most buildings you place down have the option to upgrade (little blue icon with white arrow). When you upgrade a barracks for example, it produces a stronger polearm unit. You definitely want to upgrade when you are at maximum population (currently, 100). Sometimes fewer, stronger units are better than more weaker units. Be strategic about when and how much you upgrade. In the early game, you definitely want more units, so it's preferrable to not go for the upgrades but instead, more buildings (which produce more units). * CTRL-# will set the current selected units to a control group. Then whenever you want to select that group again, you only need to hit the #. For example, you could put all your archer on CTRL-1 and select them again by hitting "1." * Double-clicking a unit will select all units of that type in the camera.